The "Rigid bodies" frame contains a table with a list of input rigid bodies. The rigid bodies serve to model regions with a high stiffness - e.g., sheeting structures or rock subgrade. This table also provides information about the currently selected rigid body displayed in the right part of the frame. Adding rigid bodies is performed in the "Add new rigid body" dialog window. This window serves to input the unit weight of the rigid body material and to select color and pattern. The rigid bodies are in the frame "Assign" ordered after input soils. Rigid bodies are introduced in the program as regions with high strength so they are not intersected by a potential slip surface. 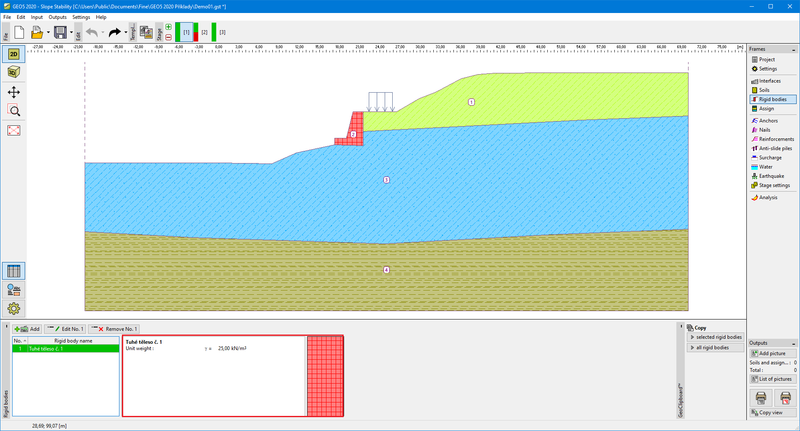 Providing we wish the slip surface to cross a rigid body (e.g., pile wall) it is recommended to model the rigid body as a soil with a cohesion corresponding to pile bearing capacity against slip. Input rigid bodies can be copied within all 2D GEO5 programs using "GeoClipboard".